Ashwini Bhat’s Millstone I, 2015, in front of the stonewall rebuilt by Dr. Robert French by the Slocum river, Westport, Massachusetts. Stoneware, 26 in. diameter. Photo by author. On several occasions, people have asked me if making art is an isolating activity. Personally, I’m drawn to the quiet and solitude of studio work. The cooperative and social nature of wood-firing gives me plenty of access to community. Still, over the years, artistic restlessness has spurred me to collaborate with artists in other mediums. Such collaborations have increased my appreciation of the suppleness of clay and its capacity as a medium for binding different genres of art and types of artists together and for making connections between varying perceptions of world and the feelings associated with them. At the same time, these collaborations have provoked new trajectories for my ceramic art. I document here three recent artistic collaborations—completed and ongoing. My early career as a dancer has, no doubt, influenced my sensibility as a ceramic artist. But my studies of literature have also shaped my mind’s eye. When I read the short prose poems of Italo Calvino’s Invisible Cities, in which Marco Polo describes fifty-five fabulous magical cities to Kubla Khan, I envisioned those cities so clearly that now, years later, after I’ve traveled to numerous countries and seen dozens of foreign cities myself, I’m not always sure whether an image I remember corresponds to a real city or a fictional one, a city I saw or one my imagination was teased to invent. In 2013, I won the George A. and Eliza Gardner Howard Fellowship for Sculpture, and Invisible Cities was the starting point for my project. When I applied for the fellowship, I proposed to make a large sculptural installation of a tapestry of ceramic pieces. Some were to be fabricated with words that, in context, would comprise a kind of open-ended poem, one that could be read in multiple ways—horizontally or vertically, or in phrasal clusters, for instance. But as I began constructing the pieces in my studio, the project metamorphosed; possibilities I hadn’t considered before blossomed before me. My own inclinations, as it turns out, seem to be more poetic than narrative. I’m not interested in “telling a story” through my art. I want to transport viewers into a world of imagination, invite them to negotiate a complex, sculptural experience. My thoughts were still oriented towards creating a tapestry-like, woven construction, but rather than inscribing words on the ceramic pieces, I wanted to work with a poet who could help me create another realm of imagery and pattern. I wanted to open myself to the potential of linking a visual pattern with a poetic one. In 2011, when I was the editorial assistant for the literary journal Almost Island, American poet Forrest Gander came as a guest writer to the journal’s annual conference. Gander spoke about observing how the structure of one of his poems matured. He talked about his realization that the poem’s structure had somehow taken the shape of the running path he followed every morning. For me, something clicked. But, it wasn’t until almost two years later, when I got the Howard Foundation Fellowship, that I had the opportunity to invite Forrest Gander to collaborate with me. As I started working, I reread Forrest’s poetry and listened to my material—the malleability of clay is always my starting point. I trusted my intuition in creating forms and was open to using other materials and adapting new techniques, if need be. I wanted the sculpture to develop from a cluster of smaller structures that created a larger pattern. I wanted to create strong spatial tensions, which were connected, in my mind, to places I’d lived and traveled. The smaller pieces began to present themselves in plaited arrangements, which helped me see the installation as a whole organism. I asked myself, what holds our bodies together? My first thought was bone and cartilage. I wondered, what might a ceramic skeleton look like? This thought process led to innovations in my working methods. To create noncylindrical structures, I rolled clay slabs around waste paper into undulant, hollow forms, rather than perfect pipes. These smaller forms looked more like bones to me. As I worked on them, I shared photos and ideas with Forrest. We both explore space in our creative work, but I wanted our exploration here to be thoroughly collaborative. 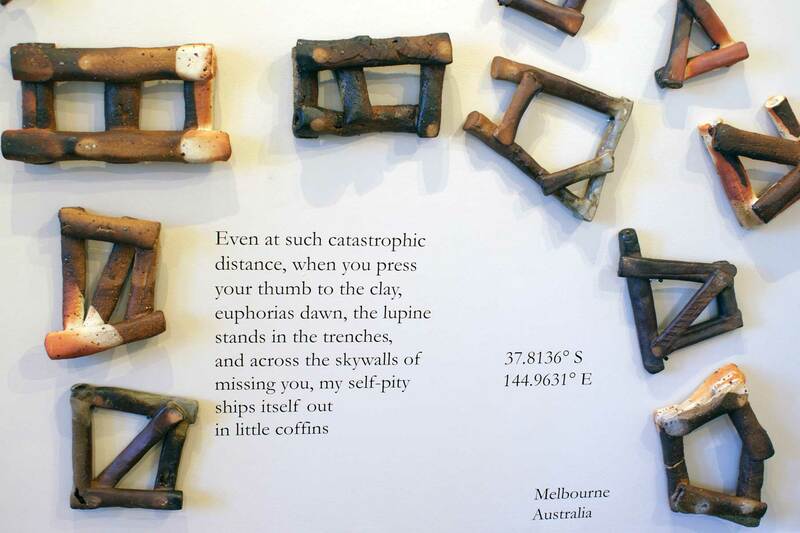 His particular ways of deploying text on the page in pulses to enact a visceral experience for the reader helped me to imagine how text might function as a part of ceramic sculptures. The project was ambitious and came to fruition in the best way. We created multitudinous and simultaneous interactions between word-patterns and patterns created by heterogeneous ceramic forms. A viewer of the clustered arrangements, which have the visual effect of both topographical mapping and bone divination, may feel rhythms of contraction and release, of skeleton and alphabet, of openness and connectivity. 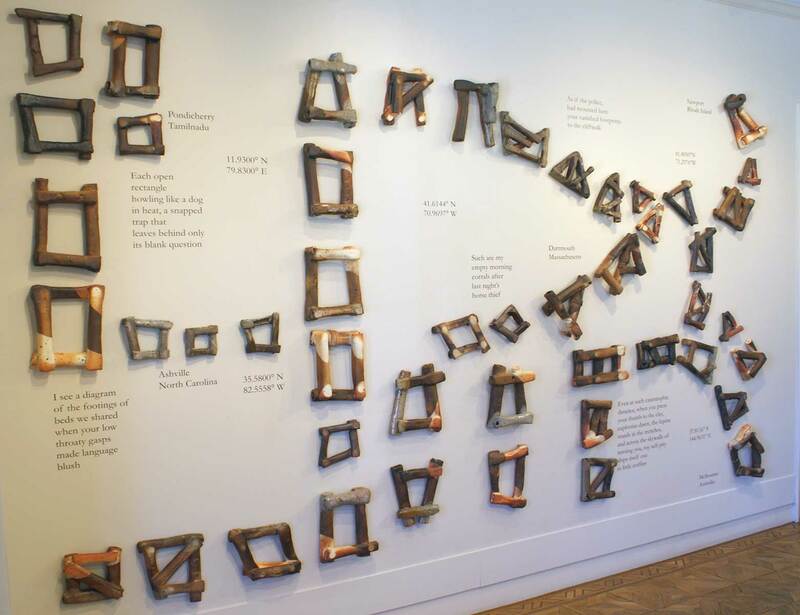 The installation, with its longitudinal and latitudinal coordinates, speaks about places traveled and imagined, and about spaces lived-in or left behind. But perhaps, more than anything, it is a palimpsest of memories of our relationships with our bodies and with the world they inhabit, locations that have been or are yet to be experienced. When I came to New Bedford, Massachusetts, as the fall resident artist at the University of Massachusetts Dartmouth, in 2015, a chance encounter led to another opportunity for collaborative work. Over dinner at John and Marlene Centeio’s bed-and-breakfast, I mentioned my fascination with South Dartmouth’s stone walls. John introduced me to his friend Dr. Robert French. Both John and Bob were members of the New Bedford Historical Society, and I learned that Bob had rebuilt many stone walls around Horseneck Beach in nearby Westport where, in 2014, I was cycling daily to and from the well-known potter Chris Gustin’s studio. John and Bob mentioned a future project for the historical society: Their plan was to clean up a corner lot on 7th Street in New Bedford, right in front of the historical Nathan and Polly Johnson house, and convert the lot into a community park in honor of the great African American writer and statesman Fredrick Douglass. Bob intended to build a stone wall along one edge of the park. This corner lot is an epicenter of history. Nathan and Polly Johnson were prominent African American abolitionists in New Bedford, and it was there that, in 1838, Fredrick Douglass and his wife found their first home as free people. Since I’d arrived in Dartmouth, I’d been reading Robert Thorson’s Stone by Stone: The Magnificent History in New England’s Stone Walls. I asked John whether there might be some way I could contribute to the venture. I’d long admired millstone forms. I’d seen small functional ones in Puttur (Karnakata), India, where I grew up, and here in New England, I noticed larger ones often set decoratively before winding driveways. I offered to contribute a large ceramic millstone to the park’s stone wall. I proposed that it be set upright between stacked stones. When John heard my proposal, he excitedly mentioned that the universal symbol for human rights is the “wheel of freedom,” which seemed to confirm my part in the project. As it turned out, I completed two large millstones for the park. Once again emphasizing the importance of place, I etched into the face of the millstone a map of New England. I imagined that as viewers looked more carefully at the details of the millstone, they would be transported outward, given a kind of aerial view of the region in which these particular stones are found. I also created a rough surface texture that mimicked the textures of both stone and the torn page of an old map. This collaboration was in some sense similar to the Compass Rose project, in terms of architectural considerations, the influence of literature, and the importance of place. However, the historical (and literal) gravity of the stones was new to me, as was collaborating with non-artists. In fact, I never thought of my collaborators, John and Bob, as non-artists. I always felt that Bob was a true artist, though his PhD in anthropology from Harvard University might not suggest it. He had a methodical way of approaching the whole project, which I found inspiring. John (also known as the Reverend John.F. Centeio, who before becoming a pastor had been a tour manager for recording artists), brought in a lively, friendly energy. Once, out of the blue I got a call from John: “Hey, Ashwini, this is your adopted father speaking. I will come pick you up tomorrow morning at seven, and we will go visit Bob.” We all went to Horseneck Beach to collect pebbles, which Bob planned to place carefully and skillfully in between the big stones on the wall (we ended the day with a brunch at Bayside). As of this writing, this project is not complete. The New Bedford Historical Society has acquired the land, and the project has been registered as a National Abolitionist Row park. 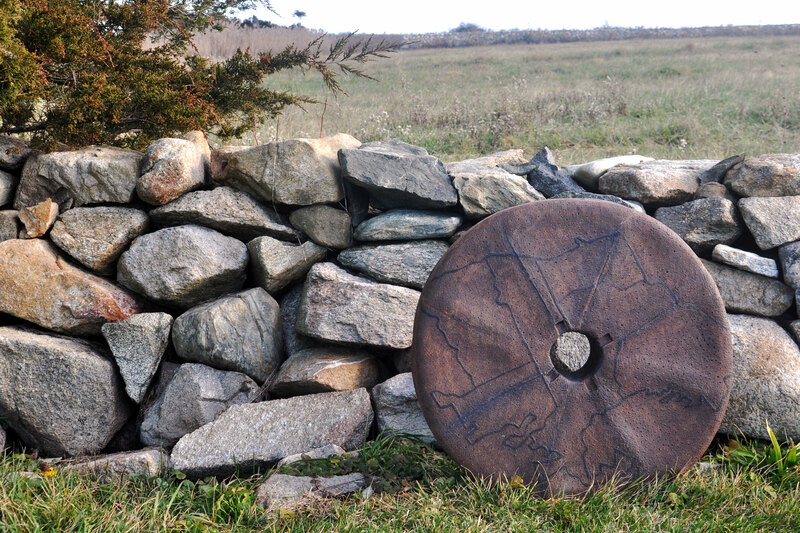 When the time comes, I look forward to working closely with John and Bob to integrate the millstones into the wall. This quote from Sharbani Das Gupta, a conceptual ceramic artist working in New Mexico, was the catalyst for my most recent collaborative art project. Sharbani invited her friend Debra Smith, a fabric artist from Kansas City, and I invited my earlier collaborator Forrest Gander to join the project. We formed an easy quartet of like-minded artists, whose goal was to explore the relationship of the human body to the earth, inspired by and with references to the phenomenon of a standing wave. Sharbani Das Gupta revisited her early clay work in the American West and stacked massive slabs of fired, glazed clay that thrust upward like rock chimneys, crags, and mesas. These might be imagined as the bones of the high desert. My own ceramic sculptures, inspired by my training as a classical dancer, were visually taut in the way that muscles are when flexed in movement. 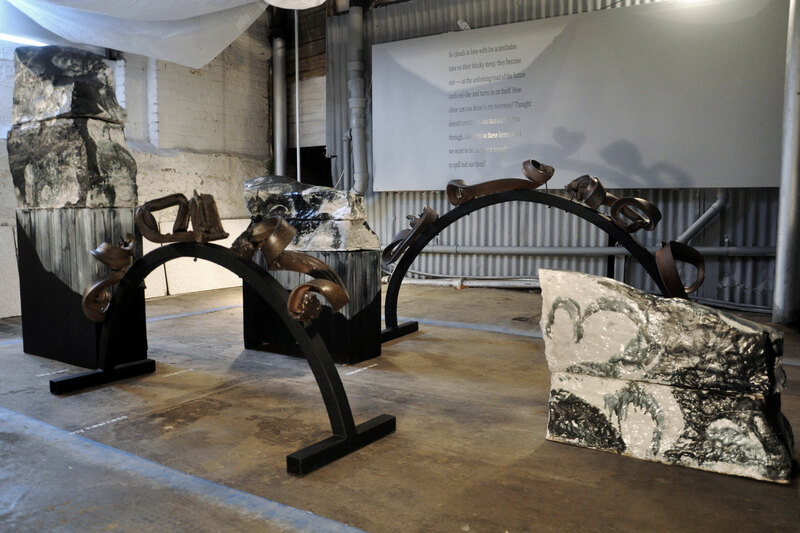 Screwed into blackened steel arches, my work formed the flesh of the piece. Debra Smith’s fabric work, a tentlike, topological tapestry of intersecting tracts, formed the skin. Forrest offered a text intended to bring all of the other forms into “communion.” Spotlights cast shadows of the sculptures onto the fabric and onto the poems which were printed on the walls. We had intended to use a recording of Forrest reading the poem to create a soundscape of pulsing energy, adding an aural dimension. We lacked the technical expertise or time to make that happen; nonetheless, it was an ambitious collaboration, drawing on disciplines as varied as dance, sculpture, tapestry, and poetry, which has the potential to expand further. To work on a multi-artist project was a new experience for me. Each artist arrived at the same point through a different path; seeing how each artist’s thought process worked was fascinating. At the opening reception, the response from our audience was quite overwhelming. People entered the gallery through a long, narrow corridor that suddenly opened into the underground, lighted exhibit. Many of the viewers (and one reviewer) told us how magically meditative an experience it was for them, how they felt as though they had taken a journey to enter a space of transformation and collaboration—a collaboration they felt a part of. In trying to understand what I’ve learned through these collaborations, I’ve wondered if an artist (even alone in her studio) is already part of a collaboration with the world she lives in. How does place affect the way we perceive and experience landscape, language, and relationships? How do we bring those distinctions into our work? Taking my practice beyond my comfort zone through collaboration with other artists has caused me to question and define my practice. However challenging it is to work with groups of people, collaboration opens up directions that none of us would have imagined on our own. Perhaps the most durable part of this work, for me, has been the ongoing conversations with other artists. I’ve been privileged to glimpse their modes of thinking; I’ve seen their processes take shape. Such continued dialogue keeps me charged and allows me to push my work further; it makes me a better, humbler artist. Collaboration has helped me to listen more attentively, expansively, and it’s prodded me to wander deeper into zones of utter discomfort in order to blaze new creative directions. 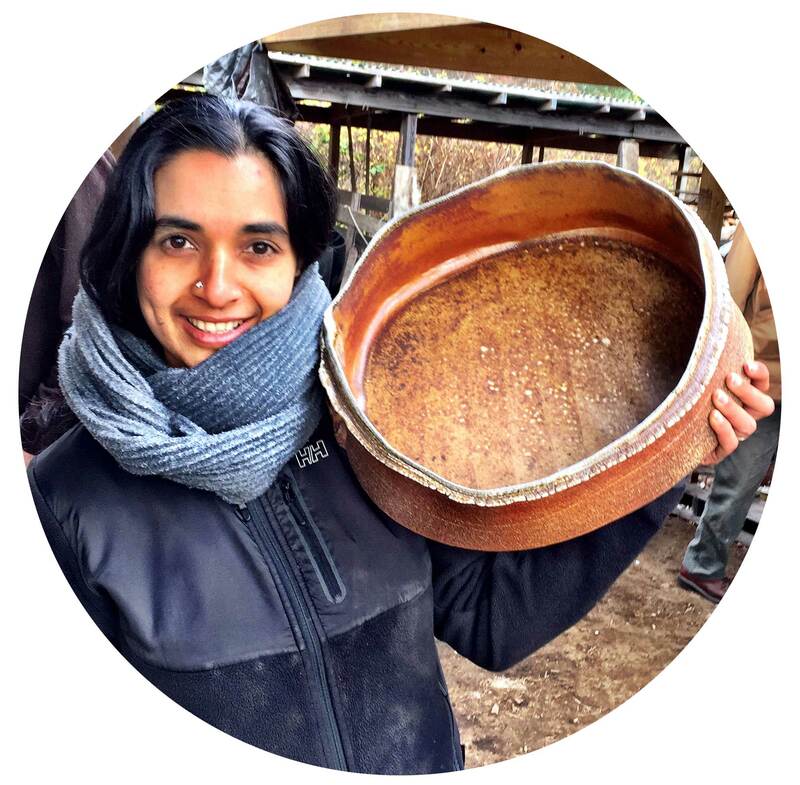 Ashwini Bhat studied ceramics with Ray Meeker at Golden Bridge Pottery, Pondicherry, India. She has a M.A degree in literature and studied classical dance for nearly ten years before working as a professional dancer in the Padmini Chettur Dance Company for four years. 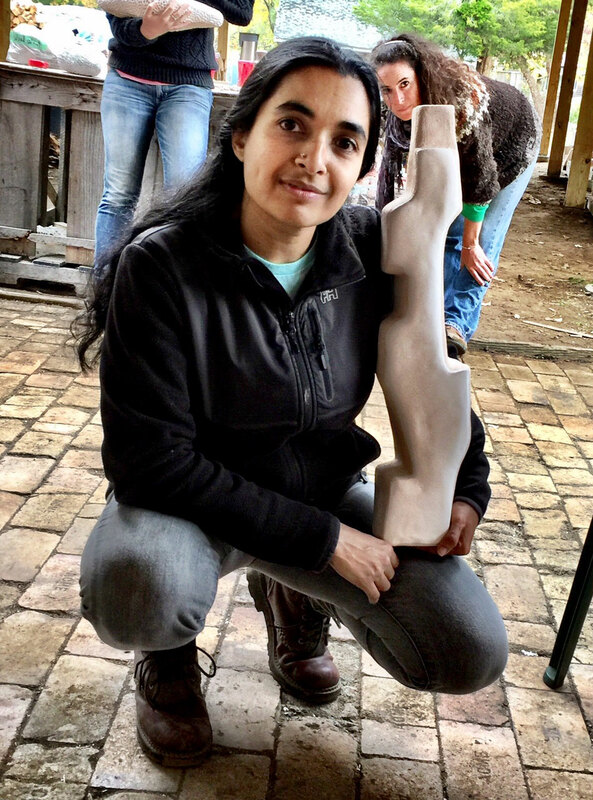 Bhat built her studio and wood-firing kiln near Auroville, Pondicherry, India and continues to make sculptural ceramic works there and in U.S., where she currently lives.